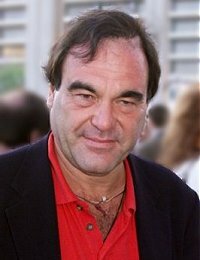 Oliver Stone has made several prominent movies, including Platoon, Salvador, Born on the Fourth of July, and JFK. He was born in New York City. Stone's mother was Catholic, his father Jewish, a stockbroker who published investment newsletters. The Stones were a very Republican family, and quite well off; he was raised largely by nannies, and attended prestigious private schools. His parents divorced when he was in high school, and only then did Stone learn of his father's many extramarital affairs with the wives of several family friends, as well as that, his father told him, the family fortune was depleted. Stone attended Yale for one year before dropping out. He taught English as a second language at the Free Pacific Institute, a Chinese school in Saigon, South Vietnam, quitting after six months. He worked as a merchant marine and traveled to Oregon and Mexico, before returning to Yale, where he promptly dropped out a second time. In 1967, at the height of the Vietnam war, Stone enlisted in the Army, and specifically requested combat duty. For "extraordinary acts of courage under fire", he received a Bronze Star and a Purple Heart, and returned home with a profound disgust for war in general, and the Vietnam war in particular. Taking advantage of the GI Bill, Stone enrolled at New York University's Film School, where his favorite teacher and eventual mentor was Martin Scorsese. Stone did some camera work for Scorsese, then worked behind the scenes on a few of Lloyd Kaufman's pre-Toxic Avenger catastrophes. In 1974, Stone wrote and directed his own Seizure, a horror film starring Jonathan Frid and Hervé Villechaize. He won an Oscar for writing Midnight Express, the 1978 film that made "Turkish prison" an endearing American cliché. His screenplays for Conan the Barbarian and Scarface gave him enough buzz to make Salvador, a violent, haunting political thriller set in El Salvador in the early 1980s. Released only a few years after the events actually happened, and while Ronald Reagan was at the peak of his popularity, Salvador did not do well, but Stone's next project had already been written, cast, and green-lighted. It was Platoon, his autobiographical allegory of good (Willem Dafoe) vs. evil (Tom Berenger) in Vietnam, and it is considered by many to be one of the greatest war films of all time. Platoon made Stone a bankable name in Hollywood, and cemented his credentials as "anti-American" in certain eyes. Platoon was the first of a trilogy of Stone's films telling the story of America's war in Vietnam from three perspectives: the troops (Platoon), the protesters (Born on the Fourth of July), and the Vietnamese (Heaven & Earth). Stone also made Wall Street, Talk Radio, and The Doors, all critical and box office successes. All these films were mildly controversial, and distinctly Stone's. But his next project, JFK, is the film he is most remembered for. Stone's JFK was overly long, and long overdue. It was the most far-fetched fantasy since The Warren Report, but it attempted to piece together clues from President John F. Kennedy's assassination, and it asked some sticky, hard to answer questions. In the months after its release, public pressure forced the federal government to unseal millions of pages of documents on the Kennedy assassination -- an unprecedented response to a motion picture. Unfortunately, more of the pertinent documents remained sealed. Stone's next major work was Natural Born Killers, a disquieting movie about serial killers, inspired by the life of Charles Starkweather. Then came Nixon, a surprisingly sympathetic look at the truly paranoid, Richard M. Nixon. Since then Stone has directed only flops and documentaries. His 2003 documentary on Fidel Castro, Comandante, was yanked by HBO and derided by Associated Press as "a barely coherent vanity production placing the filmmaker at its core while dabbling with the question: Who's that old fellow with the beard beside Oliver Stone?" The film has never been released or aired in America. A follow-up, Looking for Fidel, aired on HBO in 2004. Stone also made Persona Non Grata, a 2003 documentary featuring interviews with current and past Israeli and Palestinian leaders. As a producer, Stone's best films include The People vs. Larry Flynt, about the government's harassment of the flamboyant pornographer; Freeway, a dark retelling of "Little Red Riding Hood" starring Reese Witherspoon; and The Day Reagan Was Shot, a well-made little TV movie.